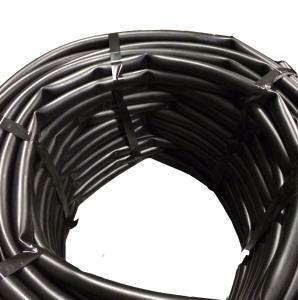 From time to time we receive tubing that is overly kinked, dirty or perhaps slightly damaged and while this tubing is still completely functional, it does not look good and in some rare cases, may have to have a small area spliced out if damaged. Damaged tubing may have puncture or abrasion in one or two spots. To repair this you simply splice out the bad area and couple the tubing together with a coupler. See the video above. All tubing can experience some amount of kinking and/or dimpling during rolling and banding. This does not take away from the functionality of the tubing, and the kinks and/or dimples will work themselves out over time as the system pressurizes and depressurizes. We have included a few photos as samples only. The amount and size of kinks will vary from roll to roll. These rolls are guaranteed to contain at least 95% useable tubing.